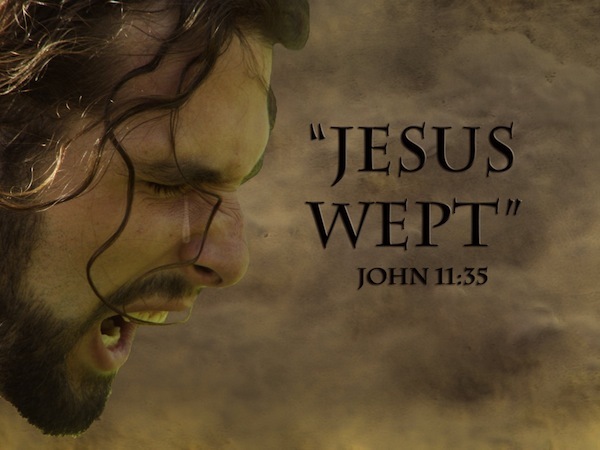 John 11:35 has been traditionally known as the shortest verse in the Bible, consisting only the words, “Jesus wept” in most translations. I say traditionally, because this varies from translation to translation and version to version. For example, in KJV, Job 3:2 says “and Job spake, and said,” but the version used largely in this blog, NIV, reads “He said”. In the NIV, Job 3:2 would be shorter than John 11:35; but since the NIV is a more modern translation, and John 11:35 has traditionally always been held as the shortest verse of the Bible, let’s just for today, pretend I use the KJV Bible. Two words. Just two words. What can we talk about from a verse with just two words? What is there to analyse and study? It should come as no surprise that I would write on the shortest verse of the Bible, having written the first verse of the Bible and the perceived center verse of the Bible. I like such statistics, whether they are reliable or not. It gives me more motivation to study. Despite being short, I think there’s a lot to think about in John 11:35. John 11 discusses the death and the resurrection of Lazarus, an intimate friend of Jesus, brother of Mary and Martha. It should be noted that the Lazarus of Bethany here is generally accepted to be different from the Lazarus of the Rich Man and Lazarus story (Luke 16:19-31) – as much as I want to draw a direct link between the two Lazaruses, I can’t. 21: “Lord,” Martha said to Jesus, “if you had been here, my brother would not have died. The two sisters both had the faith that Lazarus wouldn’t have died if Jesus had rushed back in time. But even though the scriptures told us that he stayed where he was two more days despite knowing of Lazarus’ illness – as though Jesus purposely waited till Lazarus died before going back – but while Jesus delayed the return for 2 days, by the time he arrived in Bethany, Lazarus had already been in the tomb for four days. Even if Jesus had rushed down to Bethany immediately on receiving word from the sisters, Lazarus would have been dead already. Why then, did Jesus wait for 2 days? In the New Testament, Jesus was recorded to have revived 2 specific individuals from the dead. One was Lazarus, the other was the ruler’s daughter. The ruler’s daughter was revived on the same day, and it should be noted that while Jesus did refer to Lazarus as dead, he never referred the the ruler’s daughter as dead, but merely sleeping. That said, he initially used the term ‘sleeping’ on Lazarus, but because his disciples failed to understand, he spoke bluntly to them. While the ruler had the faith to call upon Jesus even after the death of his daughter because he believed that Jesus had raise his girl from the dead, Mary and Martha (and even the disciples) did not seem to share that faith. When Lazarus died, even when Jesus spoke of his resurrection, Martha assumed Jesus was speaking of the resurrection at the last day. They were people of faith, yet, they couldn’t place hope in what they did not know could happen. Perhaps Lazarus was allowed to die so that the faith of Mary and Martha would be transcended to a new level. Jesus knew Lazarus would die, even before he left for Bethany. Jesus knew he was going to resurrect Lazarus, even before he left for Bethany. At the point of verse 35, Jesus knew he was going to resurrect Lazarus, and yet he was affected by the emotional atmosphere, and he cried. I have been puzzled by this – why cry if you’re going to resurrect him in a second? Jesus cried for Lazarus, and for Mary and for Martha, and for all the Jews who were weeping. He was compassionate for their pain. A lot of times God allows us to get hurt before delivering us. Even so, our Lord was probably crying along with us in our grief. Jesus cried for Lazarus. He will cry for you too. The family of Mary, Martha and Lazarus was likely to be a very popular family. Judging from how Mary and Martha opened their house to Jesus and welcomed him, it is likely that they are the type to open their house to friends and hold gatherings of all kinds in their houses. Upon the death of Lazarus, friends of the family came even from Jerusalem to mourn with the family, even after 4 days later. You might not be Lazarus, with lots of standing in the local community and a popular reputation. You might not be Lazarus, who had God-loving and God-fearing sisters who served and worshipped the Lord with all their hearts. You might not be Lazarus, but you can have an equally intimate relationship with the Lord. You might not be Lazarus, but Jesus will cry for you too.